Sometimes you really feel like flying. Even though you know that last minute purchase of an air ticket would most likely be expensive, you still check multiple airline websites to see if you are lucky. For us, we thought we were lucky. We were able to secure two last minute one way (with less than 4 days) tickets from Singapore to Kota Kinabalu, Malaysia (BKI) for less than SGD 100.00 each. We flew with Air Asia, one of the longest running budget airlines in the region. Boarding was easy, we did not have issue with our carry on baggage, something that you’d always worry about when traveling with a budget airline. We travelled prior to Air Asia enforcing their strict 7kg policy. Air Asia Cabin Baggage Policy: The total permitted weight for two (2) pieces must not exceed 7kg. Enforced since March 2017. Our seats were in the second to last row. Perhaps because it’s the last few rows of the plane, we were able to store our backpacks in the overhead bin without any trouble. According to Air Asia, you must pay to secure seats together, but we were happy that we got to seat together without pre booking our seats because we were being “kiasu”, the outcome of being in Singapore too long. 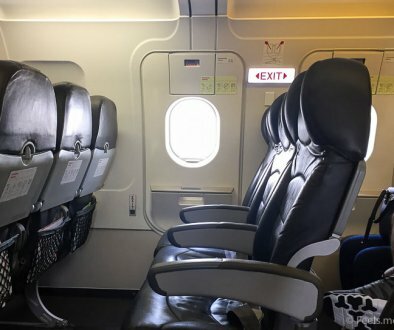 There was not much legroom, check out the photos, they should speak for themselves. Not much recline to the seats either. If you have a long legged person sitting behind you, unfortunately, you will definitely feel it. Again, the emergency row will be your best row for leg room and a larger seat. You can try to sweet talk the person at the check-in counter to see if they can assign it to you for free or else you just have to pay for it. Air Asia – SIN-BKI Review – an inch of recline? During taxi, we passed by Finnair’s A350, what a beauty it is! Minutes after the seat belt sign was turned off, the pre-ordered meals were served. Here’s a look at my Ashok’s Butter Masala Chicken Briyani Rice served warm with a small bottle of water, a plastic spoon and fork. They provided me with a napkin too. It looked simple, it was warm. It cost SGD4, so what more could one ask for? A hot meal and a choice of a small bottle of water or soft drink for SGD4 on a plane, that isn’t too bad. This is totally worth it, nothing to complain here. We plan on pre-ordering our meals again as the price is right and much cheaper than any airport options. Of course, most importantly, yes we liked the food. At SGD4.00 – we would totally pre-order our meal again. And yes we liked the food. During boarding, we were quite excited to see that our AirAsia flight was equipped with WiFi, we thought of testing it just to experience it. WiFi in our flight was powered by Rokki.com and it costs RM9 (SGD3) for 3MB and RM18(SGD6) for 10MB plan. I have no idea who designed this package and what one could one do with 10MB. Not to mentioned the 3MB package, which is only almost the size needed to view a normal webpage with any photos or videos. We did not see the use of the 10MB data, and therefore did not sign up for AirAsia’s in-flight WiFi. If you have used it before, let us know your thoughts. 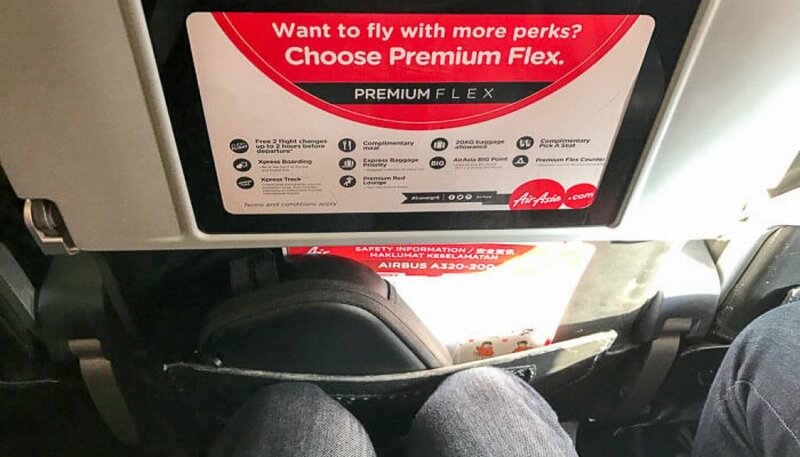 AirAsia is probably one of the few budget airline to offer complimentary in flight entertainment. Passengers could connect to Rokki WiFi and browse what shows or music that were being offered. I like the idea that once you’ve logged into the Rokki inflight system, there would be a simple prompt asking the user to use their own personal headset while using the inflight system. You could also look at the available food for purchase and some places which you may want to explore. They have some short introductions of various cities that AirAsia flies to. The food exceeded my expectation for what we had paid for it. The legroom was a big drawback, especially if you are 6 feet or taller (183 cm). The flight attendants were friendly and available if you had any needs during the flight. Will we take AirAsia again in the future? Only if there is a huge gap between a full service flight and AirAsia’s ticket price or the flight is less than 3 hours, then yes, we will consider it. Where you get to have a first hand look at our Travel and Foodie experiences.